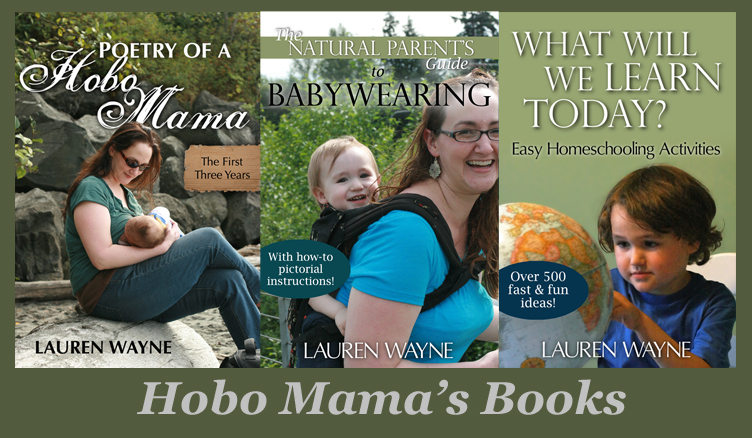 This is a joint giveaway with Hobo Mama/Hobo Mama Reviews and Natural Parents Network. You may enter at one site only. Please find the section marked "Win it!" for the mandatory main entry and optional bonus entries. Jessicurl is offering our readers a giveaway of a Light & Luminous Trial-Size Collection, a value of $36. This haircare collection for finer curls and waves includes six safe and gentle products perfect for wavy and curl hair on adults or little ones! The zippered travel pouch includes a step-by-step instructional insert with tons of tips and techniques to help you get fabulous curl enhancement and definition. 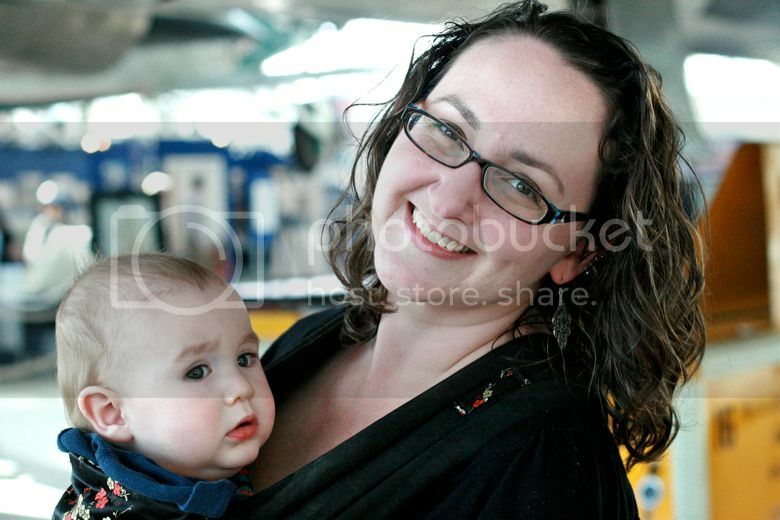 I love Jessicurl products for my wavy hair, and for my young son Mikko's. Jessicurl haircare products are made from positive ingredients that are safe and natural or naturally derived. They clean hair without stripping the natural oils, and moisturize and style without weighing down the texture. Most significantly, they've made my wavy hair look nearly curly! I first became aware of Jessicurl haircare when I was transitioning my own hair from straight to wavy — an intriguing discovery I made when I started treating my hair more gently and ditched harsh shampoos and styling products. 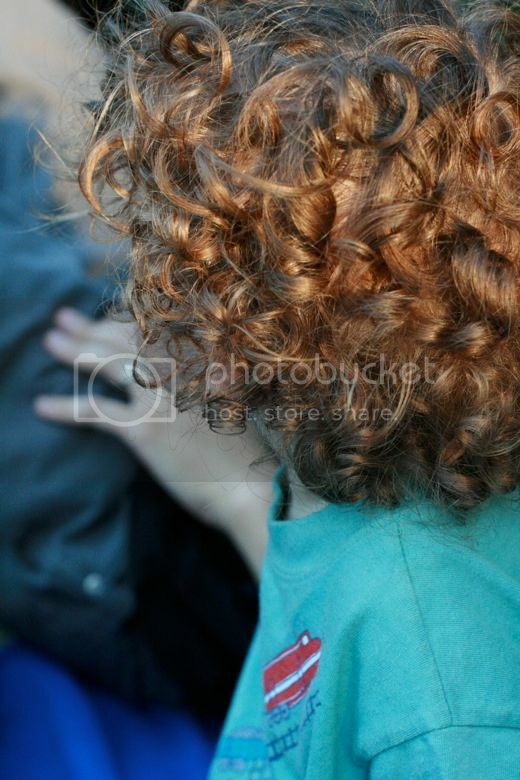 It also coincided with the birth of my firstborn, who gave us another delightful surprise: a headful of ringlets. I needed haircare products that could care for my baby's curls gently and with a natural look, and also keep my own hair looking attractive. But I wanted to make sure anything I used was safe for my baby's sensitive skin and easy on the environment. Jessicurl fit the bill! but he volunteered to model the Jessicurl products. Or perhaps he just liked playing with the bottles. One of those. Gentle Lather Shampoo is just that: a very gentle cleanser. Usually I don't use shampoo at all (just a gentle conditioner), because conventional shampoos strip the moisture from my hair and therefore kill the wave. But I can use Gentle Lather and have good-looking, wavy hair the same day! This is significant, people. It means I can use this shampoo every time I shower, with no detrimental effects to my hair's health and texture. There's also a Hair Cleansing Cream that adds moisture as it cleans and is best suited to very dry, thick, or textured hair. Aloeba Daily Conditioner (which has aloe, as you might be able to tell) is moisturizing without weighing finer hair down. It's very smooth and I can feel how light it is as I smooth it into my hair. It also makes a good leave-in conditioner for pretty much any hair type, so you don't have to rinse it out all the way. For a deep conditioner for finer hair, or a daily conditioner for dry hair, Too Shea Extra Moisturizing Conditioner kicks it. I've been using Too Shea (which features shea butter, obviously) about every third shower (I shower about twice a week, for the curious) to keep my hair nicely moisturized. I also use it after swimming in chlorine, coloring my hair, or similarly damaging activities. I put it in, pop a shower cap over my hair, and let it steam as I finish the rest of my shower, then rinse. Even though it's more moisturizing, it's not too heavy for my hair even the day I use it. Gelebration Spray is a lighter formulation of Rockin' Ringlets Styling Potion, which is the product that started it all when Jess herself formulated her own flaxseed-based styling product. She loved it on her own ringlets, and it turned out that curly friends loved it, too, so she bottled it! Gelebration Spray has the word "spray" in it, but I don't find it sprays very evenly. For that reason, I usually spray into my palm and then smooth the product through my dripping wet hair, just post-shower. I took a Jessicurl tip to flip my head upside down first — it really does help the curl form even better! I scrunch two or three palmfuls of Gelebration Spray into my hair. Gelebration Spray is a pretty light gel on its own. It helps the curl form, but I feel that the next product, Confident Coils, is necessary to help the curl stay put. Gelebration Spray is also very watery, so it's necessary to do just a small palmful at a time and be careful about not spilling it as you apply. I like that I can really see the flaxseed origins of this gel in its naturally brown color. Using this has made my curls bouncier and more defined. I really love Confident Coils. It's a smooth white cream that works with the Gelebration Spray (or Rockin' Ringlets, if you have thicker hair) to help hold the curl. I need just a tiny amount (as in the picture above); if I use too much, it weighs down my hair and makes it too sticky. But with a small amount through my wet hair, it ends up gorgeous! With both styling products together, I find I have bouncy, well-defined waves and even a few curls (woot!) that last all day. They do not make my hair look crunchy or wet as some gels can do; any crunch can be gently scrunched out after the hair has dried, but I don't ever need to. I let my hair air dry, with the roots supported with a clip and excess moisture scrunched out with a microfiber towel. If I'm feeling ambitious, I use a hair dryer and pile the curls on top of the diffuser, pushing them toward my head — that makes them even more defined. Either way, I just love the way Jessicurl products make my hair look and feel! 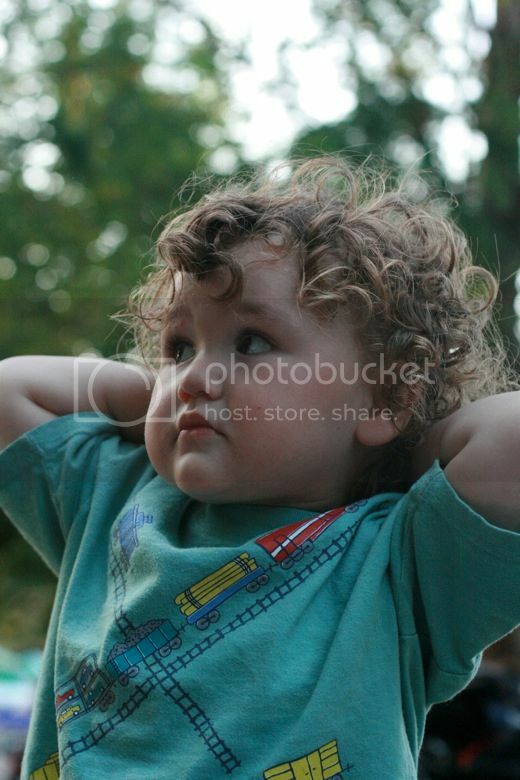 but Mikko's hair looked great with them when it was curly! Awe Inspiraling Spray has me a little stumped, I have to confess. I love the idea of a second-day spray that refreshes curls, but I can't get it to work as well as spraying a lot of water on instead. I've tried spraying it on dry hair and on wet, but I haven't noticed much difference. If anyone figures it out, let me know! I'll keep experimenting. I'll mention that one other downside I've found to Jessicurl products is that they're lower hold in general. Second-day hair is less defined than when I use a more conventional gel, and my roots tend to go flatter with Jessicurl as well (not always a bad thing; sometimes gel makes them stick up in odd ways). I've been experimenting with adding a dab of gel to my roots before I put in the clip. That seems to help. And for second-day (and third-day, etc.) hair, I wet it or just pull it back, as per usual! Jessicurl puts a lot of emphasis on choosing safe, healthy ingredients and, most importantly to me, being entirely transparent about which ingredients they use and why. Many ingredients are natural or naturally derived, and Jessicurl provides explanations for the non-natural ingredients they've chosen to include. You can also rest assured that NONE of our products contain any animal ingredients, nor do we test on animals. All of our products are tested on many heads of curls — people who actually want to be a part of the development. These aspects of Jessicurl will never change. Natural ingredients include nourishing aloe vera, coconut oil, jojoba oil, cocoa butter, avocado oil, flax seeds, shea butter, and an herbal "hair tea." Some of the non-natural ingredients are humectants, emollients, and a tiny amount of preservatives. What's critical is what ingredients they don't have: silicones that coat strands and are hard to wash out, harsh cleansing agents, drying alcohols, and the like. All the ingredients are specially chosen to nourish and strengthen hair, protect natural oils, and make curls and waves look their best with every use. The trial sizes come unscented, and you can choose unscented for the full-size products as well. Otherwise, Jessicurl offers two fragrances, and scent samples are included in the trial: Citrus Lavender and Island Fantasy. I've tried both and find the Citrus Lavender (lavender, grapefruit, and orange essential oils) is heavier on the citrus, and Island Fantasy (coconut, vanilla, and citrus) is heavy on the coconut. From reviews I've gathered that many people seem to prefer the Island Fantasy, but I'd guess that's a personal thing. Citrus Lavender is a lighter scent and has no synthetic fragrances so is a good choice for anyone with sensitivities. However, since sniff-critic Mikko hates them both, I've learned my lesson to get the No Fragrance option next time! For use on kids, that's not a bad idea, anyway. One downside to the Jessicurl line is the price. I stopped using it for awhile because I needed to put my money elsewhere. Now that I've gotten to use it again, though, I'm hooked. It does such great things for my hair that I've decided it's worth the cost for me. A regular 8-ounce bottle of product costs $16.95. Since it's a small company with high-quality products, I'm willing to pay more for something that works well for my hair so consistently. There are a few ways to save money: You can buy larger amounts (32 ounces in a pump bottle such as you'd see at a salon, or even a gallon jug!) if you know you like it and want to decant it into a smaller bottle for the shower or vanity. Buying the products in a collection also cuts down on the price, whether you choose the 2-ounce or 8-ounce sets. You can also buy the 2-ounce sizes for travel or trial purposes for $6.95 each, or a 0.5-ounce sample for only $1.50 just to give something a go. You can choose one free sample with each order, or buy additional samples singly or with an order. That means you can decide if it's right for you before committing, so give it a try — I know you'll love it! You should also sign up for the Very Important Curly newsletter for ongoing discounts, and see the Buy It section below for an amazing discount just for our readers! Jessicurl is the baby of Jess, a lovely lady with a head of ringlets who needed naturally inspired haircare to manage her own curls. Her motto? You can read more of Jess's story on her site and follow along with her blog. I'll give you a hint, too: If you sign up for the Very Important Curly newsletter, you'll receive an immediate 20% discount code, notices of future sales, and a heads up whenever Jess is in your town. That's right — you can meet the curly girl herself! One thing I love about Jessicurl is how committed they are to making sure your waves and curls look their best. The key to that, as they've noted, is education. Jessicurl.com boasts a whole Curly Care Center with tons of tips and videos on how to care for curls and use Jessicurl products. The Curly Care Center will walk you through identifying your own curl type (I'm a 2a-2b) and choosing what products will work for you, and then teaching you how to wash, dry, and style your hair to bring out its natural texture. I highly recommend checking out whatever video looks closest to your hair type — you're sure to learn a thing or two, and be astonished at just how amazing your hair could look with proper products and techniques! You can purchase Jessicurl curly hair care products online at Jessicurl.com or at local salons and co-ops and from international websites. Jessicurl offers products geared toward wavy and curly hair of all types and textures, from cleansing to moisturizing to styling to accessories. Just for our readers, Jessicurl is offering a 20% discount off any order at Jessicurl.com from now until September 12! Enter code HBMA94632 at checkout. For your own chance to win a Jessicurl Light & Luminous Trial Collection, enter by leaving a comment and using our Rafflecopter system below. Note: I bet I could get them to agree to a Rich & Radiant trial-size collection instead if that would better suit your hair or your family's. If you win, just let us know in your reply email and I'll work it out. They're very similar collections, but Rich & Radiant products are selected to be ultra-moisturizing for thicker hair. MANDATORY ENTRY: Visit Jessicurl.com and tell us something you've learned about curly hair care! You must enter your name and email address in the Rafflecopter entry system for your entry to count, after leaving a comment on the blog post. See the Rafflecopter entry system for bonus entries to increase your chance of winning after completing the mandatory entry. All bonus entries are entered into Rafflecopter. Give it a try, and email or leave a comment if you have any questions! Contest closes August 14, 2012, at 11:59 p.m. Eastern Time. Disclosure: Our reviewer received a product for review. i learned that the creator of jessicurl created this product line after being teased about her curly hair in school - kids can be so cruel!